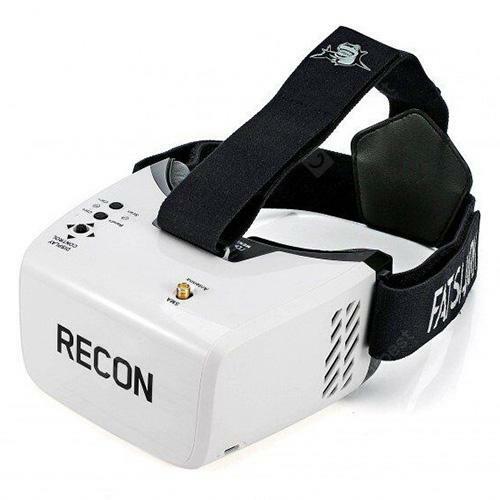 FATSHARK Recon V2 FPV Goggle Glasses 4.3 inch LCD - WHITE w cenie $64.99 | Chińskie kupony rabatowe, zniżki i okazje! – Battery Charging: the battery in the headset is a standard 18650 2600mAh Li-ion cell, and can be changed with built-in charger by connecting a micro USB power supply to the headset. – Brightness and Contrast: slide the 5-way button left and right or forward and back for brightness and contrast adjustment. – Channel Selection: short press channel Up ( CH+ ) / Down ( CH- ) button to incrementally increase / decrease the channels. Long press and release the Up ( CH+ ) button to change band; long press and release the Down ( CH- ) button to do auto scan active channel. – DVR Recording: long press down the 5-way button for 3s to activate DVR module ( short beeping ), Tap the 5-way button and listen for the short beep to start and stop recording video from the live feed. Long-press the 5-way button to enter the DVR menu and browse / play content. This DVR has no auto save recording file function, need to manually stop recording to save file.